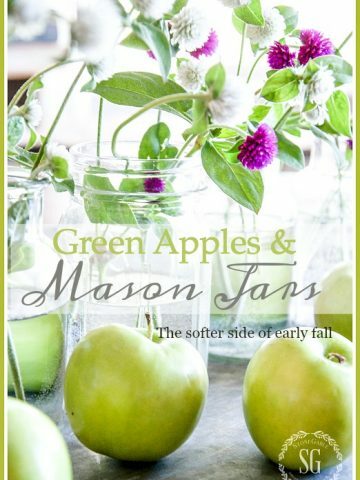 Don’t we all love mason jars? I’m always looking for recipes that I can individualize and put in a pretty jar! I think it makes food more special. So when I found that the lid of these beloved jars could be used as little tart pans my heart skipped a beat! I just had to share my very first MASON JAR LID TART with you. They are soooooo easy to make and turned out to be scrumptious, indeed! I can’t wait for you to try these!!!! 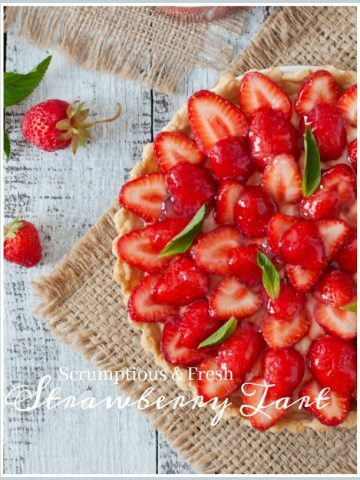 Here are a couple of tips that will help your achieve tart perfection! Use wide-mouthed jar lids. Put the metal lid into the metal screw rim so the rubber banding is facing down. Give them a little spritz with a Baker’s Joy or Pam. Use refrigerated ready-made pie crust. I used a very large circle cookie cutter to cut out the dough. You can also cut around a saucer or other dish or glass to make the dough circles to fit into the mason jar lids. Use your imagination and fill each baked pie shell with something wonderful! I used a little raspberry jam to line the bottom of the baked pie shell before I added chocolate ganache. Oh, YUMMY! When the chocolate ganache has totally set you can push up on the bottom of the lid while holding on to the metal rim and carefully take the tarts out of the mason jar lid tart pan. 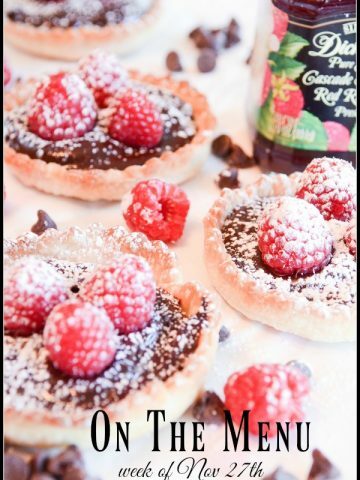 Don’t forget to give the tarts a little dusting of confectioner’s sugar… or a dollop of fresh whipped cream! I hope you will try these easy-to-make little tarts and fill them with your favorite kind of flavors! 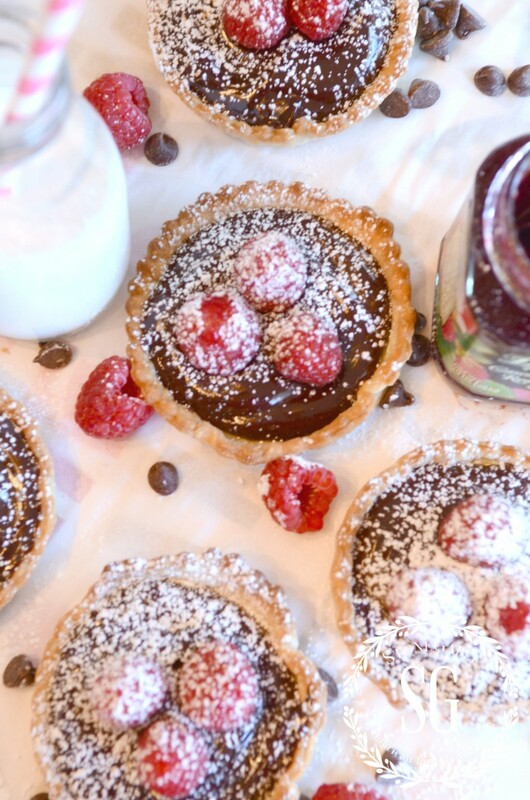 An easy to make scrumptious little chocolate tart with a surprise of raspberry! Preheat oven according to pie crust directions. 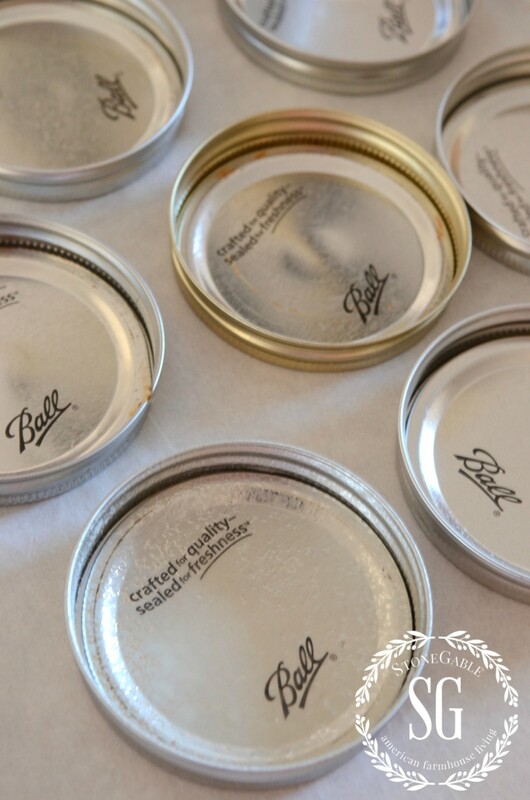 Place 8 large mouth mason jar lids with the rubber strip facing down in their rims on a parchment lined baking sheet. Spray with cooking spray. 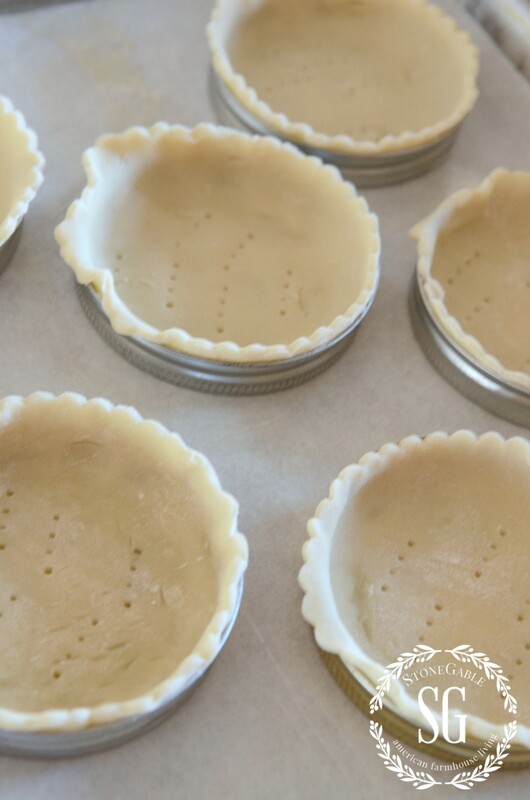 Cut out 8 pie crust rounds large enough to cover the the mason jar lid bottom, side and with a little hanging over the top edge. Prick with a fork. Refrigerate for 30 minutes. Bake for 10-12 minutes until the edges of the crust are golden brown. Let cool. Do not remove from the mason jar lids. Meanwhile, bring the heavy cream to a simmer in a small pot on the stove. Put chocolate chips into a seperate bowl and add the simmering cream to them, whisking constantly, until the chocolate chips are all melted. Add the vanilla and stir in. When the tart shells are completely cool add about 1/2-1 tsp raspberry jam to the bottom of the tart. Spread as evenly as you can. Fill the tart with the chocolate ganache. Add 3 raspberries to the top of each little tart. You can also add fresh whipped cream before adding the raspberries. Lemon curd would be a delicious alternative to the chocolate. Remember to pin this to your Pinterest RECIPE or FOOD boards. You can follow me on Pinterest and see all the mason jar things I’m finding to pin HERE! Made these today for Valentine’s Day! They were wonderful. However, I used strawberry instead of raspberry and used chocolate dipped strawberry to garnish with home made whipped cream. Also used a lemon curd for some since I have a child that doesn’t care for chocolate.. not sure where she got that craziness! Very easy and the chocolate ganache was perfect. Love them. Y’all got to try sometime. Thanks for sharing! I have a pretty heart baking dish I want to use for V day. Do you think I could make these as one big tart? Not sure Rebecca. I bet you could use it to make the crust, but the filling probably will not work. It’s more of a chocolate ganache than a pie filling for a bigger pie. Oh Yvonne, this tart recipe sounds wonderful! I make up 10 piecrusts at a time, wrap them individually and freeze. This makes it easy for me to bake pies at the drop of a hat and I think I have all of the ingredients to make these tarts! My lucky family! Thank you for the recipe. You are welcome, Jackie! I’d love to have 10 frozen pie crusts. What a great idea! What a great idea! I only hope I remember it. Pin it! Then you will remember! This sounds awesome, egg allergy friendly (grandson) and delicious! My niece is getting married next year, after a horrible accident. And I want to help her out by making some THINGS for her reception, and these look perfect for a large crowd… thanks for the inspiration! God bless your niece and her fiance’. I made thees 2 years ago for dessert on Easter. They were a big hit. I have never had a bad recipe from your posts. Okay I am in love, chocolate and raspberries. A match made in heaven. Not to mention a new use for all my canning jar lids and rings. What a fun idea for a dessert. I love the combination. Wow, do you think these would hold up for our church bake sale Valentines weekend? Yvonne, I like your attitude about getting ready for Christmas. And I try my best not to let others remarks put pressure on my preparations. 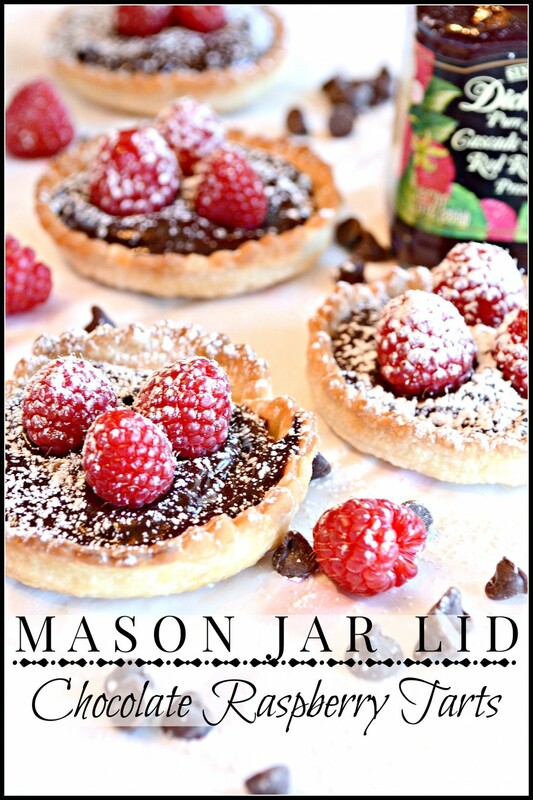 Can’t wait to try the jar lid tarts! For people with limited storage space dual purpose tools make perfect sense. These are amazing. Don’t know how you thought of this idea, but it is absolutely amazing!!! These look fabulous! I would have never thought to use Mason Jar lids. 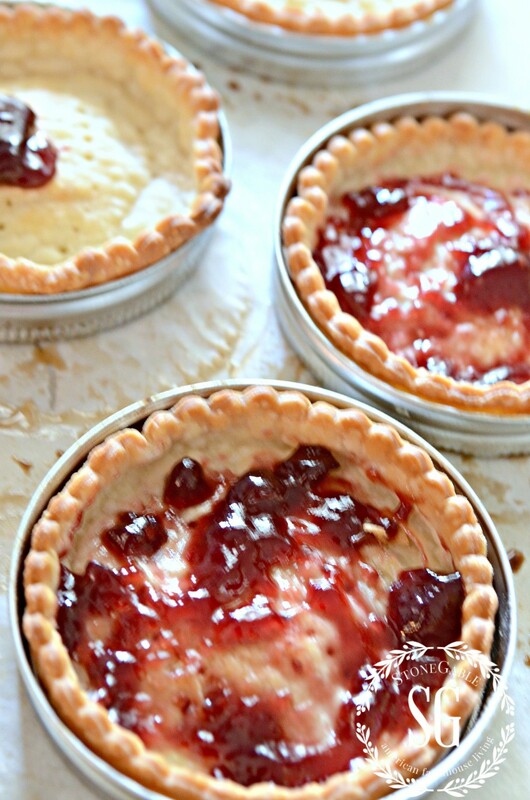 OMGosh….these little tarts are so cute and look so delicious. Because I can, I have lots of those lids. Thank you. These are the best ever! Made them for my son’s rehearsal dinner. They were a HUGE hit. Thank-you so much for the recipe. So glad you liked them Marty Ann! I was wondering if you would be willing to tell me what size scalloped cutter you used. I cut my pie shapes too big and they hung way over the lids and made a mess–they were delicious, but looked like a terrible hot mess. I was hoping to buy a scalloped cutter, but I just don’t know where or what size I need for the wide mouth lids. I want to keep making them but I just want them to look nicer. Use a cutter that is just a little bigger than your lid. If you cutter is too big, you can always cut it down. Those are absolutely yummy looking. I have so many leftover lids from crafts and now I know what to do with them. Now you do and they are so much cheaper than mini tart pans! how did you make the little scalloped edges? My cutter had a scalloped edge. Thank you for such a clever, beautiful dessert that looks so easy to make! I love your blog. Great ideas, beautiful pictures also! 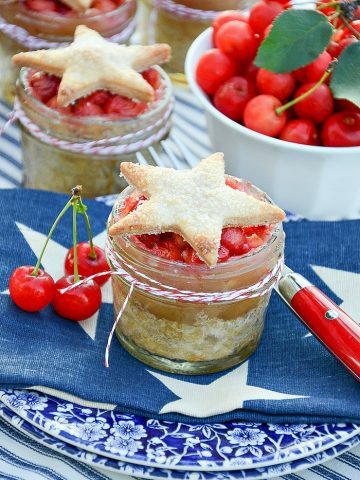 These look so good and such a cute idea to use mason jar lids…almost like a min spring form pan for making cheesecakes. They were so easy to make and so delicious to eat. Have a great week and these tarts deserve 5 stars. This is absolutely brilliant. I’m not sure how I found your blog recently, but I’m addicted. Such clever and cute ideas! Yvonne: What a fantastic idea for dessert for Easter. Can you tell me what size mason jar are your lids from? bigger ones for this dessert. This is one of the greatest ideas I have ever seen. Made them with blueberry jam and lemon curd. Just love making small tastings for deserts since most people are on some type of diet and watch calories. A tray of items such as chocolate mousse in shooter glasses, these wonderful tarts with different fillings, small cupcakes made in the mini pans are not only a wonderful choice but make an impressive showing. And are easy. Yvonne! These are so cute. I just love the “mini” look of them, and I am sure they are tasty too. Just adorable though. Perfect for tea, shower or birthday. Yvonne, I made pumpkin tarts for Thanksgiving. I used the regular lids- was just a mouthful!!! These are darling! I can’t wait to give them a try! Oh man! Those look so good, Yvonne! Last year when you made those lemon tarts I copied them at Easter and they were a huge hit. Your suggestion of filling these with lemon would certainly satisfy the craving for a bigger lemon tart pie! Thanks for sharing. I’ve never seen the mason jar lid used for this purpose. I do believe you have just created the next new thing – the mason jar lid dessert! Amazing and they look delicious! Definitely pinning!!! Brilliant!!!! I love this idea! I am definitely making these for Easter!!! Beautiful pictures,! You can almost taste the tarts! I’ve never seen such a thing before. They are just beautiful and delicious too I bet. What a clever idea.